At the end of the investigation it became clear that the whitewash layers dated to Madison’s time. In fact, because whitewashes were usually applied every five to ten years, the four layers of whitewash found on the fragment indicated that the columns were whitewashed for at least 20 to 40 years prior to ca. 1848. Furthermore, no evidence of dirt was found between the tan stucco surface and the first layer of white plaster, indicating the thin white plaster was applied soon after the tan stucco. Finally, a quote from an 1825 visitor to Montpelier named Ann Mercer Slaughter also reveals that the columns were painted white. In her account of her visit she describes the Portico at Montpelier as “spacious and painted a dazzling white,” further strengthening the argument that the columns were painted white in Madison’s time. With this information in hand, the Restoration Team, along with the restoration's Advisory Committee, agreed that the columns should be whitewashed. A ca. 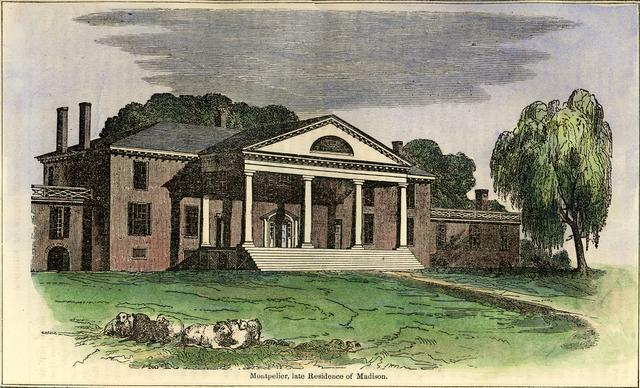 1830 engraving of Montpelier showing white Portico columns.